Is Ted only pretending not to know why a guy like this totally “unqualified” monster/creep got the job? In case it’s still not clear: he IS qualified to do precisely what he was installed to do – destroy local public education. Note: this is NOT only a local project. Local public education is not a success story. One of the problems is the way it is run: top-down. It is like a medieval fiefdom, with a superintendent, lots of assistant superintendents for all sorts of things, lots and lots of administrators and then, staff. This is an antiquated model. The superintendent position needs to be done away with. The position calls for fiscal responsibility and they are not responsible. Frankly, public education has brought this threat upon itself by not holding the line when it should and by embracing change when it should not. A big problem is apathetic students. We waste a lot of money. Look at your tax bill. And then we want more. Perhaps those who are using the system should contribute more. That would address student apathy. > Is Ted only pretending not to know why a guy like this totally “unqualified” monster/creep got the job? I love the question, and note that it can be applied to multiple overpaid and underperforming public school employees.. When Janus goes through, the public sector unions will take a hit, allowing for further erosion of the public system. The public school system only works well, in the sense of having standards and enforcing rules, in well-heeled towns. You may not like the sense of authoritarianism, but other systems, such as LA., are in a free fall that no one can change. Remember Freedom Riders? That teacher left the classroom. Those in it for the long haul give up, worn down by the system. @Crazy H–shouldn’t you be looking for a job instead of spending so much time on Ted’s blog? You, give me work to do? You’re funny. You’re not ready to carry my helmet. The only thing you may be ready to do is mop the locker room. Now, folks, let’s ignore Crazy H, who is going to bed when it is still light out. 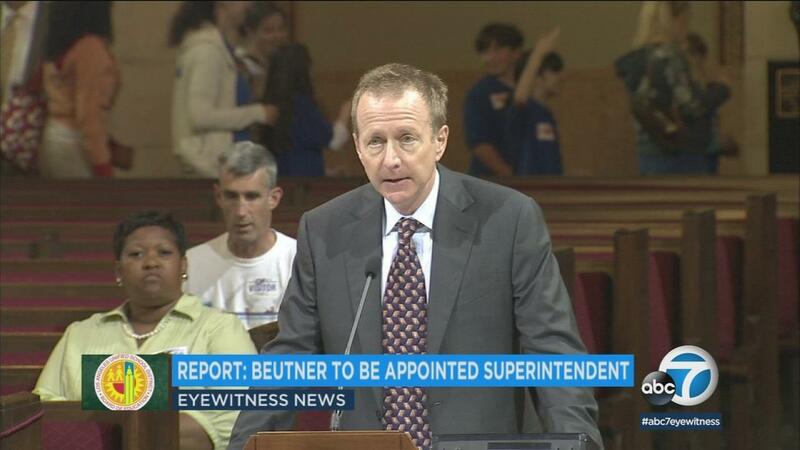 It is insulting to everyone, parents, teachers students, that Beutner got this job. He doesn’t know education law; he doesn’t know the culture of any of those schools; and while he may know finance, he doesn’t know school finance. Having a mother who was a school teacher is not a qualification. I’m sorry Mr. Awesome Teacher, sir. I know you don’t like to answer questions, but I need information if you’re ever going to save me. Your helpful and informative reply below leads me to believe that you know full well Trump has ulterior motives which run contrary to the best interests of the country. If that’s the case, why did you vote for him? I am awesome. You got that right. And I made some awesome comments on Ted’s piece. Did you read them? They were about Austin Beutner and the role of a school superintendent. Ted’s piece was about Austin Beutner, not Donald Trump. The comment section is for that topic. The piece is about a rich guy pursing a low-paying job in politics. I made a generalization about rich guys pursuing low-paying jobs in politics. You replied in a derisive manner, so I asked you about a different rich guy guy pursuing a career in politics. You are not conducting an enhanced interrogation. The piece is about Ted’s nemesis, Beutner. Comment on the piece, if you can, and please don’t drag Jesus into it. You can talk with Evil Wiard about Trump. I’m sorry Mr. Awesome Teacher, sir – but it is *you* who chose to reply to my comment. This piece isn’t strictly about how “Local public education is not a success story” either; yet you found it relevant enough to comment upon. I’m sure it’s just a coincidence, but you seem only to complain about topicality when you’re running away. Oh, and that makes three evasions. Okay, pal, I was responding to Falco. If you want to talk about Beutner, the role of a superintendent, local public education, I am here. I don’t want to talk about talking about something. Anyway, as I was saying before Crazy H had to jump in, one should try to find out the perks that Beutner had negotiated into his contract, in addition to his $350,000 salary. For example, does he get a car? An annuity? Hair cuts paid for? Dry cleaning done? A clothing allowance? You would be surprised to see what superintendents get negotiated into their contracts that is hidden in other parts of the budget. One does have to wonder why millionaires/billionaires seek political office when said office pays far less than their day jobs. We can safely assume they aren’t in it to make life better for the little people. Oh, that was a brilliant comment, Crazy H, really incisive. For tomorrow’s lesson, please write a short essay detailing Donald Trump’s reasons for seeking the presidency. For extra credit, explain how those motivations are good for the country. Rumor has it Trump was simply running because he could. No one understood the actual depth of angry amongst the genpop. The rumor maintains he never actually intended to win and there were tears flowing openly when he did. His family didn’t want to be in the spotlight. In the end, Trump won because the rabid genpop was so pissed they assumed someone would actually listen to their desires and needs and change the USA, if not the world, for them. Simplified Trump won because of a massive amount of pissed off citizens. @Wiz – that was good. Please don’t let Awesome Teacher copy your homework. He needs to learn to think on his own. You mentioned a teacher had a 200 year old sword. What style is this, or is it simply ornamental? Most people don’t know that duels were fought with bokken because the Samurai didn’t want to destroy his precious sword. Not all duels, mind you. If you watch Zatoichi films people drop from a sliced belly. I recently learned that those cuts send someone into immediate shock and they pass out to bleed out. Or with intestines hanging out and bleeding out. Bruce Lee in his first film was filming and telling the stuntmen to drop after he kicked them. The director came pissed and asked him why, Lee replied ” I only need one kick”. If you watch the famous Bob Wall kick from Enter the Dragon, Lee didn’t side snap he hit Wall then thrust with his leg. Angry Bruce must have been a fun guy. It’s a hand made katana – fully functional and not a toy. I don’t know its history, but there are no nicks along the edge. Beutler will have tremendous power and will be able to do a lot of damage in s short amount of time. He will be able to hire assistant superintendents and other administrators, making the city more top- heavy than it probably already is. He will be able to lay off teachers and aides. He will be able to award contracts: not just for iPads, but for consultants, testing packages, attendance packages, and whatever falls under miscellaneous in the budget. Parents and taxpayers need to attend every school board meeting to see where the money is going. Zero Hedge keeps doing articles on how CALPERS is fucked. No money in the pension fund.